Sometimes a baby just needs a bunny hat. This was a gift for a shower paired with a pair of pink Ugg Boots. It is always either bunnies or skulls in my books. Bunnies won this time. The pattern is from Itty Bitty Hats. 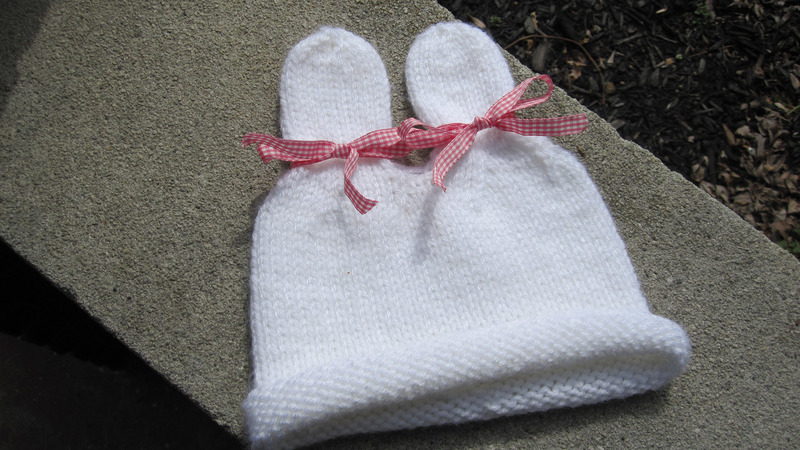 Made out of Vanna’s Choice yarn and pre-washed so even the new mom won’t be intimidated by caring for this knitwear. Just toss it in the wash. Babies are messy, yo. I actually have been knitting, but I’ve frogged out the past 4 projects. The alpaca yarn I’m working with doesn’t want to be any of the projects I have tried. This time it is going to be a plain scarf even if I kill myself knitting it! Baby blanket in the works. Baby Bear Hat: I Totally Forgot To Post This!